Stovers! 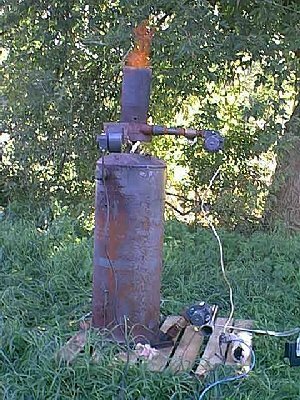 A design of the wood-gas cook stove very good. The return process is better. I give the version on a figure. The stove received more complexes, but more effective. The products of pirolis will pass through incandescent coal and completely will be destroyed. There can be somebody it will roar to check up? The first reaction is exothermic, while the last two are endothermic. So pass air/oxygen, CO2 and H2O through coal and you produce CO + H2. Coal gasification was the principle form before 1940 and was practiced at a large scale because of the need to remove sulfur and ash. During WW II however, biomass was the fuel of choice for small gasifiers to run cars, trucks and buses. Biomass is typically 80% gas plus volatiles plus 20% fixed carbon. So the main problem is to convert the volatiles to CO + H2. 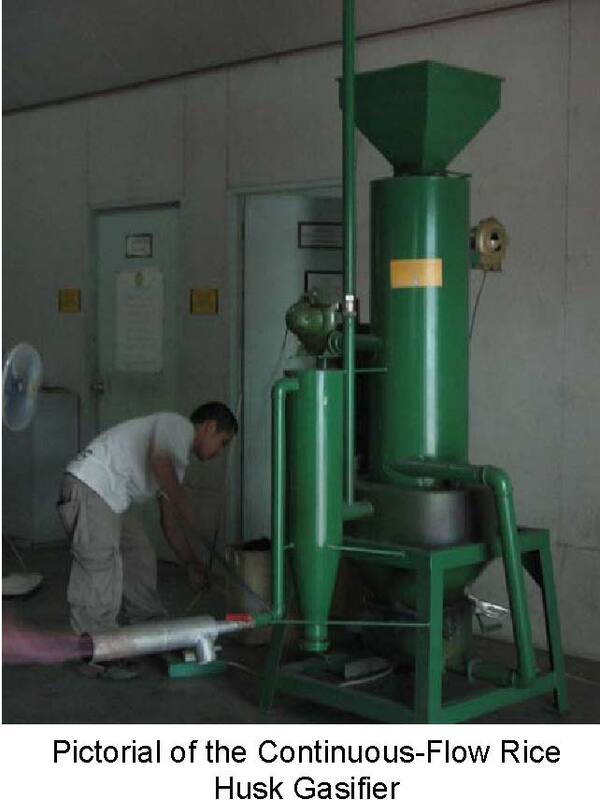 Pyrolysis typically occurs at 300-500C. 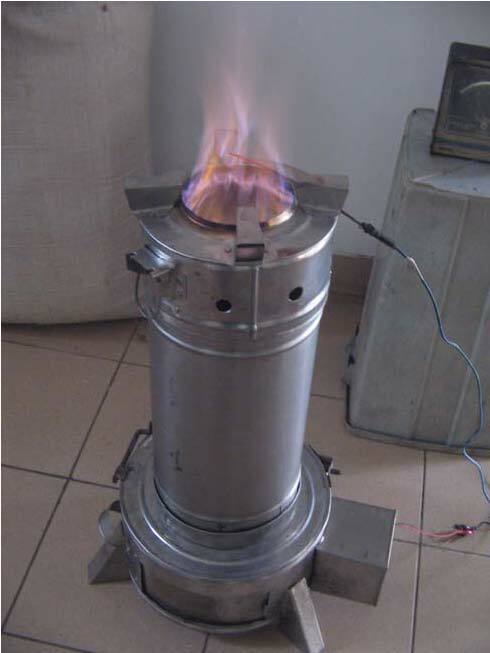 Conventional bottom lit updraft gasifiers burn charcoal on a grate to produce hot CO-H2 which then pyrolyzes the incoming biomass to make VERY tarry gas. *(I call this a "char burning, tar making gasifier")*. pass through the remaining charcoal where most of the volatiles are destroyed. At the high end the condensibles are typically < 100 ppm. At the low end, more like 2000. *(I call this a "tar burning, char making gasifier"). I call the Flaming Pyrolysis process "PYROLYTIC GASIFICATION". It occurs at a continuum of temperatures from 700-1000C, depending on air/fuel ratio. At the low end, 700C, very little of the charcoal is gasified and the toplit updraft stoves produce 5-25% charcoal, depending on the moisture content of the fuel. At the high end up to 1000C the gas is VERY low tar and useful for operating engines for power and transportation and for synthesis of methanol and diesel. . If secondary air is added to the gases after they are generated you have a very clean and hot flame. 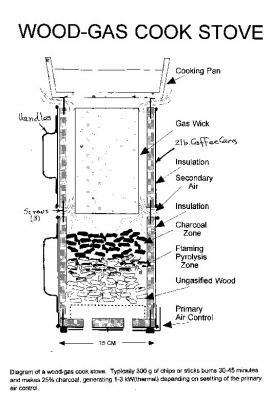 This is VERY different from direct combustion and I classify our WoodGas Campstove as a close coupled pyrolytic gasifier and combustor. field cooking around the world. We hope they will be.